Rotary encoders are commonly used to measure belt speed in conveyor applications including synchronizing conveyors to pick-and-place operations and synchronizing the operation of multiple conveyor belts to one another. Rotary encoders are also used to track linear distance of an item traveling on a conveyor after a check-weigher or x-ray so that it can be removed from the line by a rejecting mechanism. The indirect measurement method involves monitoring the shaft of the motor driving the conveyor belt. The encoder should be mounted directly to the motor shaft. It will output either a pulse stream (for an incremental encoder) or a digital word (for an absolute encoder) that corresponds to the displacement of the motor shaft. where fp is pulse frequency in hertz. The drawback to this approach is that it does not consider mechanical slop that may be introduced by the coupling, gearbox, belt slip, etc. This also brings up an important point: the mechanical performance of the conveyor belt and the speed resolution of the motor are the limiting factors in maintaining consistent speed with a conveyor belt. All an encoder can do is report. The resolution needs to be high enough that it the encoder can accurately report the change in position that gets converted to speed. Specifying an encoder with resolution above that will not improve system performance and may even lead to an erroneous reading. 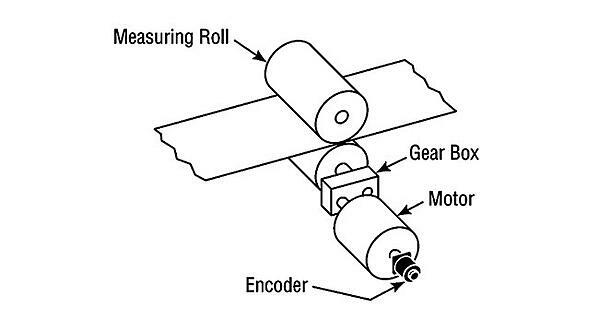 Depending on access to the motor, it might be easier to mount the encoder on the roller shaft. where D is diameter of the roller in inches. Although more accurate than a motor-mounted encoder, this approach still suffers from mechanical error introduced by belt slip, etc. 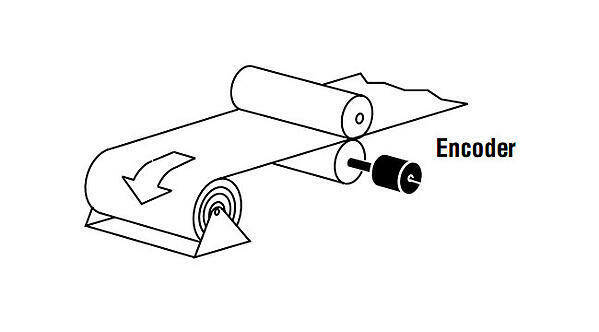 The third way to monitor conveyor speed is to attach an encoder to an encoder measuring wheel that rides on the surface of the belt or one of the rollers if the belt itself is crowded with product. Typically, these wheels are 1 foot in circumference, which makes an easy conversion from RPM to linear speed in feet per minute. It is important to remember that a follower wheel is a mechanical assembly and can degrade accuracy. Error sources include misalignment and slippage between the wheels and the surface being measured. Applying preload helps prevent that slip but increases bearing wear. Finally, the follower wheel itself can wear, particularly in the case of misalignment. 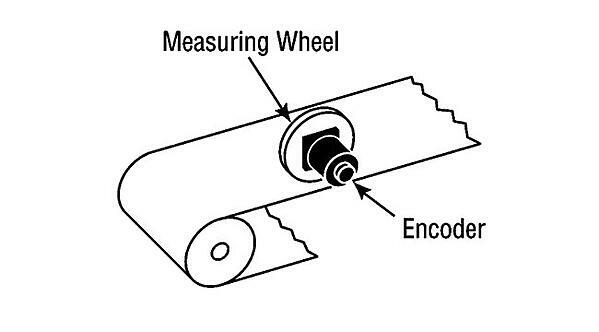 To address this problem, some encoder measuring wheels feature dual O-rings on the circumference that can be replaced when necessary, extending the lifetime of the wheel itself. And remember, the follower wheel, not the performance of the encoder, is the limiting error source. Synchronizing the speed of one conveyor belt with another requires multiple encoders and a master-slave architecture. The motor has an encoder mounted to the shaft as described above. The slave conveyor has an encoder mounted to a shaft originating from a set of rollers on the secondary conveyor. Both encoders are wired back to the controller. The assembly on the slave controller is purely a feedback system. With that input, the controller can monitor any speed differential between the primary conveyor belt and the secondary conveyor belt. Any time that difference exceeds tolerance, the controller can command the drive to speed up the motor until the speed of the primary belt matches that of the secondary belt.